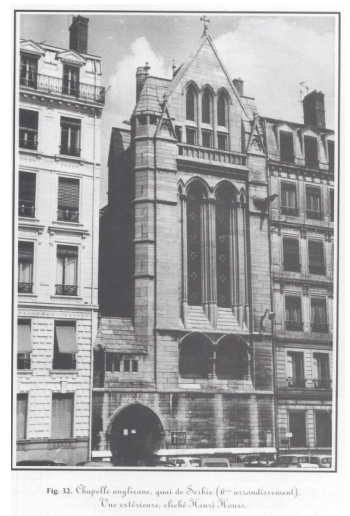 Where is the Anglican church in Lyon? In the past, when people have asked me where the Anglican church is in Lyon, I have sometimes whispered with a twinkle in my eye………“everywhere”! It’s a light-hearted remark that carries some truths. Our community is geographically widespread around the city and beyond (especially as some of our members still consider us as church family despite the fact that they have moved to other countries). “Everywhere” also hints at the reality of our ‘ministry’. As we are relatively small, we engage and support existing ministries rather than creating and carrying our own. Therefore people meet our members engaging in all sorts of activities and enterprises around the city – we serve in multiple locations. 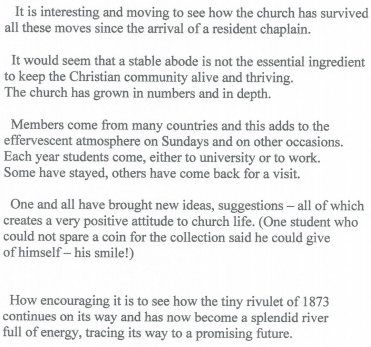 The aspect of being ‘everywhere’ I like the most, however, is the suggestion that the Anglican church in Lyon is not a building, but a network, a people, a community. Over the course of the last few months, there have been two parallel developments. On one side we have been growing as a community and as such have encountered some of the demands of a growing community – the need for improved security exits, working disabled access to the building, baby changing facilities and, as 30% of our church is under 18 of age, increased and consistent space for our youth groups. The other development is that the Diocese of Lyon has been considering the future of the En Guedi building and asking if they are in a position to meet and host our needs. Their decision is that En Guedi will become more specifically a convent and play less of parish role. Consequently we have been asked to move to alternative premises when we have found somewhere suitable. The diocese of Lyon have offered their support and have started suggesting alternative locations. We are also exploring other ‘pistes’ with other churches and I am encouraged by the friendship and solidarity of a number of churches around the city. As you can see from the chart that Jean and Jean Guichot and Marian Plichon have recorded in their book “A Pilgrim Church – Lyon Anglican Church, recollections from the 60’s”, part of our church DNA is that we are a mobile community that can meet in a variety of different locations and can adapt and improvise to establish worship, community and mission wherever we find ourselves. Whilst there are practical and logistical answers to the “why?” question, I can’t help feeling that this next stage of our church development is part of God’s initiative to confirm who we are, what we do, where and for whom. As Israel was led and shaped by their pilgrimage through the wilderness I am confident the the Lord will be leading us and shaping us for the next phase of our life together in Lyon. 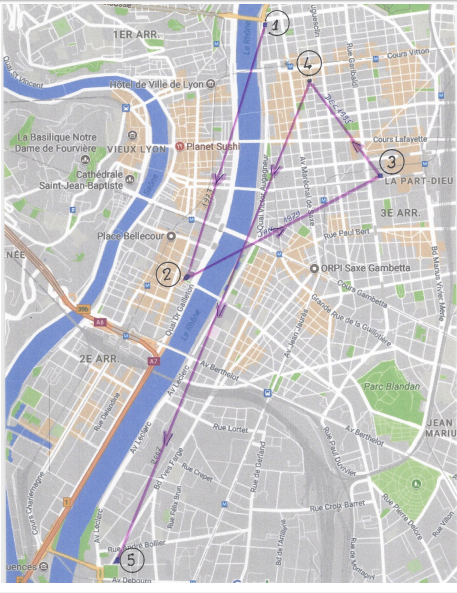 We are going to continue pursuing leads and engaging in conversations with the diocese and other locations to see what will fit us best, but in the meantime, please be on the lookout for potential city centre locations – schools, colleges, retirement homes, churches, religious institutions could all be possible leads, we would welcome any suggestions or contacts! I hope that this is a helpful explanation, feel free to be in contact if you have any questions but in the meantime, I thought the final page of Jean, Jean & Marian’s book was particularly encouraging as it records our past and speaks to our future. Trinity Church is on the move!